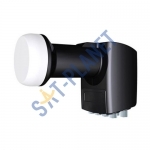 A low-noise block downconverter or LNB is the receiving device mounted on satellite dishes used for satellite TV reception, which collects the radio waves from the dish. An LNB with a single feedhorn but multiple outputs for connection to multiple tuners (in separate receivers or within the same receiver in the case of a twin-tuner PVR receiver). 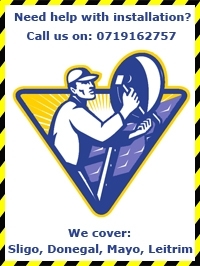 Typically, two, four or eight outputs are provided. 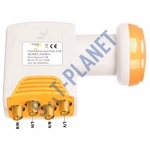 Each output responds to the tuners independently of the other outputs and "appears" to the tuner to be a separate LNB, so twin LNB allow you to run 2 satellite receivers from one satellite dish, quad LNB allow you to run up to 4 satellite receivers from one satellite dish etc. 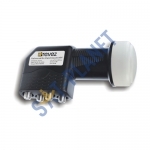 The Inverto QUAD LNB with terrestrial input is a high quality product with very low noise ..
Revez Quad LNB QLP-4 is a high quality product with a very low noise figure of 0.1dB .. 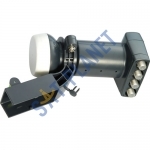 It's latest model of Sky Quad LNB for the newest MK4 Sky Satellite dishes. It's full HD compatible a.. 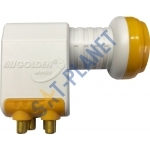 The Golden Media Quad LNB GM-204 is a high quality product with a very low noise figu..